Lori grew up on a farm in Ohio, where her love of animals first started. She has always had cats, dogs and horses, as well as assorted fish, gerbils, guinea pigs and goats. 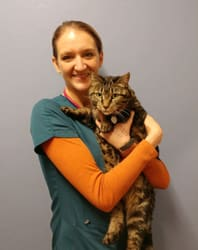 After spending 10 years in the U.S. Air Force as a Russian Linguist, she went to Essex Community College in Maryland to pursue a career as a Veterinary Technician. 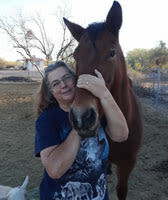 She later moved to Tucson in 1999 and immediately fell in love with the desert; three years later she received her certification as a Veterinary Technician and has maintained it ever since. 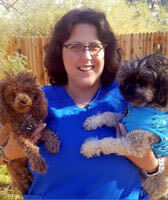 Lori has been a Veterinary Technician for 20 years and 4 1/2 years ago became a Client Service Representative. Lori loves helping animals and their owners, and currently has several horses, three goats, three dogs, and a plethora of cats. Sara is a native of Tucson and has a love of all animals. 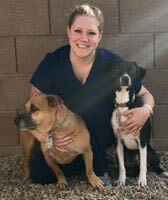 She was in the first graduating class at Pima Community College for Veterinary Technology and recently graduated from the University of Arizona in Animal Studies. Sara has 4 miniature poodles, Savannah, Stormie, Gracie and Gabby as well as a 20-gallon fish tank. She also has several horses and has been riding since she was 2 years old. Sara’s hobbies include helping animals, 4x4 off roading, and ghost town hunting. She recently joined the Catalina Pet Hospital team in November 2017. Whitney grew up in Georgia and New Mexico with a variety of family pets and a love of both domestic animals and wildlife, While completing her degree in Ecology & Evolutionary Biology from the University of Arizona, Whitney worked in an animal behavior lab, interned at Reid Park Zoo, and participated in a habitat restoration project on Philip Island in Victoria, Australia. Whitney has been a part time Customer Service Representative at Catalina Pet Hospital since 2012, and a full time Zookeeper since 2013. Whitney shares her home with her husband, her dog Knox, her cats Halley and Comet and her turtle Shelbert. Lexi was born and raised in Tucson Az. Over the past 6 years she and her family have been traveling the world with the military. Lexi has returned to her passion of helping animals, and is currently working on her bachelor's in Wildlife Science. Lexi shares her home with her hisband , 2 childern and the newest family member "batman hotdog" their long haired dachshund. Lexi enjoys the sunshine and the beautiful mountains of Tucson. 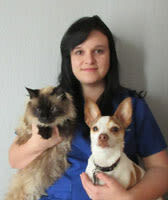 Jen is from Tucson, Arizona and joined the Catalina Pet Hospital team in 2014. She graduated from Pima Medical Institute with an Associates Degree in Veterinary Medicine. Growing up, Jen always had a lot of pets so it’s no wonder she currently shares her home with 4 cats and 6 dogs. In her free time Jen loves spending time with her family, watching movies, and taking her dogs for walks. 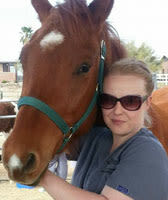 Julia is a native of Tucson, Arizona and graduated from the Veterinary Assistant Program at Carrington College. From a young age, Julia developed a love for all animals. She grew up with dogs, cats, fish, hamsters, birds, and even had a snake! 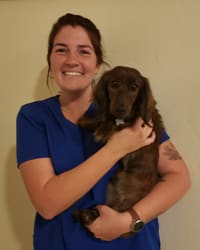 Julia has been a part of the Catalina Pet Hospital team since 2014 and loves her career. When she is not working she is spending time with family, friends, and taking care of her dog Gizmo and her cat, Alexander. Sara has lived in Tucson, Az for over 10 years but was born in Kansas where she spent most of her childhood. She has been working in the veterinary field since 2007 and has loved every minute of it! Since Sara was a young child she has always had animals around her including rats, turtles, cats, chickens, dogs and horses. In her free time, Sara loves being outside in nature with her daughter Jenna and her 2 four legged kids Prudence and Echo! Kayla was born and raised in the Desert Hills, Arizona. She grew up on a ranch surrounded by horses, pigs, chickens, goats, dogs and cats. 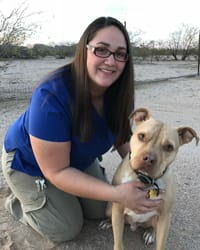 After serving in the United States Air Force, Kayla pursued her passion for animals and graduated from Pima Medical Institute as a certified Veterinary Assistant. She is currently working on her associates in Animal Science in order to become a certified Veterinary Technician. Kayla shares her home with her 3 dogs Hoss, Oliver and Annie, her bird Bob and 2 leopard geckos. In her free time Kayla enjoys hiking, singing and exercising. Kayla recently joined the Catalina Pet Hospital team in 2017.